The Pens broke their 5 game losing streak in stellar fashion with a 5-2 win over the ailing Thrashers. This was nothing new as the Pens have owned Atlanta winning in their last seven meetings. Though the interesting part of this was "when" and "how" they won. Dan Potash enlightened us to the fact that the Penguins were riding a 5 game losing streak at this exact point last season, from December 27th on. And just as interesting was the fact that they broke their losing streak on the first Tuesday of the New Year...against Atlanta...at home. This year Jordan Staal lead the pack with 2 goals. Last year it was Petr Sykora with 2 of his own. Exciting to see us repeat certain aspects from last year. Interesting nonetheless. But the important thing here is the Pens won and they (and us) got a little confidence back. Staalzy was huge tonight and showed more effort than just his 3 points. Despite the game starting off with the excitement of a chess game, the scoring picked up in the second. Beej was huge early on with the Pens giving up the first 11 shots to Atlanta and essentially giving them several chances to go on top. Near the end of the first the Pens went on the powerplay when Luca Caputi drew a penalty on rookie Evander Kane, who by the way looks to be a very good prospect for Atlanta. Even though the chances were there they didn't capitalize. And while Crosby had three passes that were less than impressive, the powerplay did give them a little pep. The Pens turned on the juice a little with a couple quality scoring chances within the last minute, but nothing doing. Let me clarify, offensively they had some jump, defensively they were making the Thrashers look like Team Canada with as many scoring chances and open shots from the point. Though Atlanta wasn't about to make this goal determine the game. They came right back and Johnson makes a great save on Kane from Armstrong. Then it was a Jim Slater (Jim Slater?) breakaway that put Atlanta on the board, [1-1]. 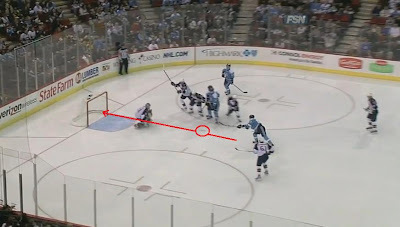 Two things went wrong on this goal, puck management and the defense being out of position. With the puck in the neutral zone you can't allow a man to split you down the middle on a breakaway, you can't. Afterward around the 6:20 mark Geno makes a bad pass. 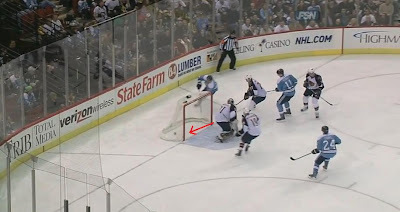 While I wouldn't normally mention or point out Geno's flaws I just really felt this was one of those can could have (and nearly did) result in a goal. 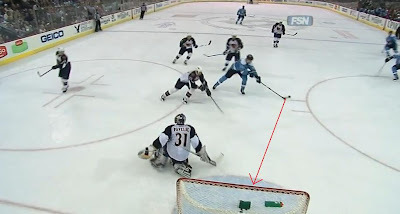 Later Crosby does the same thing (see below), which does result in a goal against. 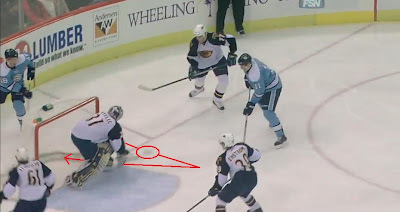 This is what Bylsma was talking about, puck management and good pass decisions. This my friends, was not a smart play. Fortunately less than two minutes later we saw another goal for the Pens. This time it was Jordan Staal from TK. When these two are clicking, good things happen. Staal leaned his way into the zone to get the puck poked away right onto the stick of TK who wraps himself around Pavelec but dishes to Staal beforehand for the goal, [2-1]. Afterward Holyfield goes to the box for hooking Letang, adding to the powerplay woes. At the end Staalzy had a breakaway chance and was hooked by Hainsly...back on the powerplay. This time it was different. The first line went out and couldn't get anything to happen. Out came Staal and his second line compadres. Nearing the end of the powerplay Staal makes the play again. Feds brought it in the Thrashers zone, Army decides to blow a hit on Staal, Feds dishes to Staal back to Feds, [3-1]. Though as with the first goal of the game Atlanta came right back. Crosby attempts a little scrum along the boards in the Pens zone and interestingly "centers" the puck. It ends up on Jim Slater's stick who beats Beej for the second time in the period, [3-2]. You read my pregame quote by Sid, "Its a combination of making mistakes and paying for them." Well, there you go again, Sid. Overall we did see a better looking period. In my opinion if not for the two incidents above the score would be 3-0. How else is Jim Slater, a guy who had 2 goals this year coming into the game get 2 more in one period? You were thinking what we were all thinking, can we hold on to this lead. Well, after going on the PK a little over a minute into the period you started to worry that much more. Though interestingly the Pens controlled the whole PK. Staal nearly had a chance with a howitzer point blank. Dupuis raced down the ice to almost beat Pavelec to the puck. It was a quick two minutes lets just say. It wasn't until the 8:32 mark where the Pens struck again. Malkin COMPLETELY redeems his lack of effort from earlier. 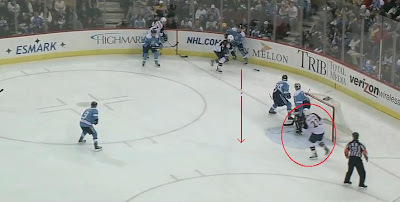 He makes a tremendous defensive play (takeaway) to get the puck Feds who leads Geno with a pass where he beats one man, then puts it through the legs of another, gets stopped by Pavelec but chips the puck while on his back to keep it alive and Caputi cleans up the garbage. As much credit you want to give to Caputi for scoring, this is one of those plays where Geno just completely took over and didn't quit. Some 7 minutes later Staal and TK team up again to seal the deal. 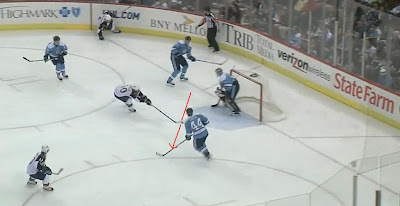 TK does what he does best and fly through the neutral zone to and light one up just pass the blue line. 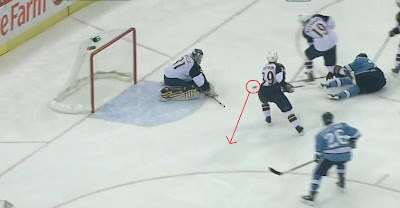 While Pavelec was there to make the save, he wasn't in position for the rebound. Staalzy was. Cake walk. Lauren attributes the "unicorn" reference to the always witty, always bitchy Puck Huffers. It's amazing what happens when you attack the net. Caputi keeps this up he might be here to stay. Hate to say it, we didn't miss Max. It's amazing what happens when Staal gets angry and overly aggressive. Good thing Antropov didn't play, we have trouble with big bodies.